Truffle loves dressing up ! His tail kept on wagging ! The knitted stripes were made by GoY member Terry60 .. He looks gorgeous - I'm not surprised he won! easy to see he likes it. even dogs that like dressing up often dislike caps! what a little character. terry picked out a good color for him! .. and so kind ..
.. knitting in Rome and mailing to the UK ! Hi Stripes... thank you ..
That is just fabulous! Well done TT and well done truffle - I can see his tail wagging! 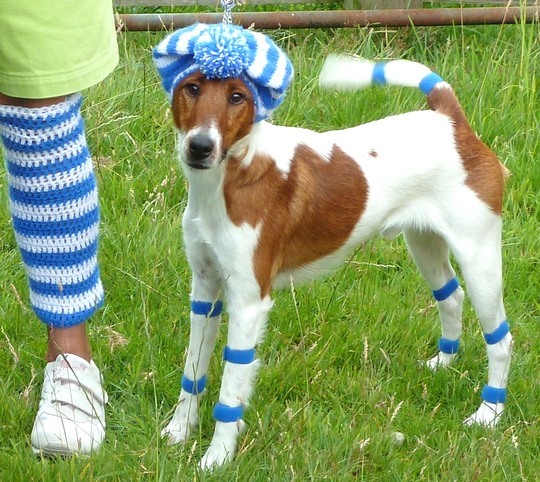 If Truffle wags hard enough, he can ping those blue stripes off his tail, all the way to the edge of the dog show ... Lol.. I want to know what team you both support TT? Who is it wears blue and white? He stands so elegantly...very well trained. Thanks... Terry60 did well with the knitting ..
love the expression very captivating humerous photo thankyou Truffles and terratoonie. How adorable! He's a sweetie. Well done all six legs!! Well done Truffle. What a great idea, it's no wonder he won. Perhaps next time he could go French with a black beret and a couple of onions over his shoulders. Look like you had fun! ... Hilda Spice meets Sporty Ogden ? ;o) Lol. Brilliant TT, you can see he was the star of the show. He looks the business. Very smart indeed. Fab pressie to have, especially all the way from Italy. She is so clever with knitting ! A fox terrier? Not often seen these days. Super. Hi Magnoliamad .. Thanks ..
... but now they are on the list of "endangered" British Dog Breeds [ vulnerable native breeds ] along with others such as the Welsh Terrier and Sealyham Terrier. Hhehe, this made me smile :) I love it! He looks absolutely gorgeous and I'm sure he knows it! cookie has a crush on truffle! You make me laugh this time around!! !